The Kansa Charlton Chrome Table Lamp is a stylish Chrome finish desk lamp, reminiscent of the Art Deco period. The Kansa Charlton White Table Lamp is a stylish Chrome finish desk lamp with a white glass shade, reminiscent of the Art Deco period. The Firstlight Clarion is a fully adjustable desk lamp in an Antique Gold finish. 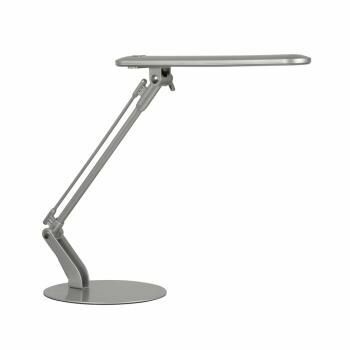 The Firstlight Clarion is a fully adjustable desk lamp in a Brushed Chrome finish. The Classic Bankers Lamp is hand made in England from soild brass with a green glass shade. The Oaks Delta Desk Lamp is in an Antique Brass finish with an integral dimmer.. The Oaks Draven Desk Lamp is in a Black finish and is fully adjustable. The Oaks Draven Desk Lamp is in a White finish and is fully adjustable.. The Franklite TL508 Table Lamp is in a Gold finish with a fully adjustable head and integral dimmer. The Firstlight Hampton is a fully adjustable desk lamp in an Antique Gold finish. The Firstlight Hampton is a fully adjustable desk lamp in a Brushed Chrome finish. The Firstlight Harvard Desk Lamp is in a White finish. The Oaks Madison Desk Lamp is in Black with chrome trim. The Oaks Madison Desk Lamp is in Blue with chrome trim. The Oaks Madison Desk Lamp is in Cream with chrome trim. The Oaks Madison Desk Lamp is in Dark Grey with chrome trim. The Oaks Madison Desk Lamp is in Duck Egg with chrome trim. The Oaks Madison Desk Lamp is in Green with chrome trim. The Oaks Madison Desk Lamp is in Orange with chrome trim. The Oaks Madison Desk Lamp is in Pink with chrome trim. The Oaks Madison Desk Lamp is in Red with chrome trim. 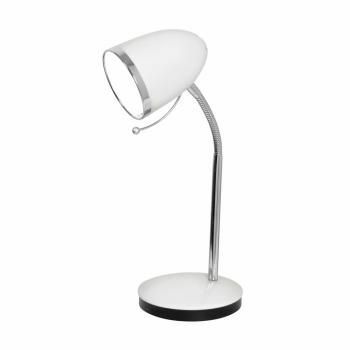 The Oaks Madison Desk Lamp is in White with chrome trim. 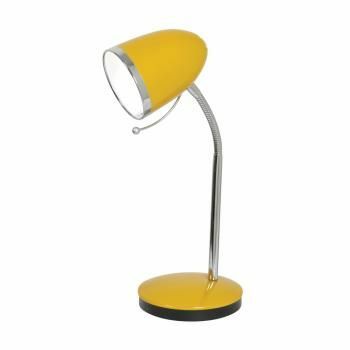 The Oaks Madison Desk Lamp is in Yellow with chrome trim. The Oaks Metis Desk Lamp is in an Antique Brass finish with a flexi head and toggle switch. The Oaks Metis Desk Lamp is in an Antique Chrome finish with a flexi head and toggle switch. The Oaks Metis Desk Lamp is in a Black Chrome finish with a flexi head and toggle switch. The Oaks Metis Desk Lamp is in a Chrome finish with a flexi head and toggle switch. The Oaks Metis Desk Lamp is in a White finish with a flexi head and toggle switch. The Firstlight Milan LED Desk Lamp is in an Antique Brass finish with a dimmer switch on the base. The Firstlight Milan LED Desk Lamp is in a Brushed Steel finish with a dimmer switch on the base. The Koklarz Nonna Desk Lamp is in an Antique Brass finish with a white glass shade with a blue flower design. The Oaks Orin LED Desk Lamp is in an Antique Brass finish. The Oaks Orin LED Desk Lamp is in an Antique Chrome finish. The Otis Desk Lamp has a sleek Black metal shade lined with sparkling crystal optics. Hand made in England from soild brass lamp with bell green glass shade. The Firstlight Ring Table lamp is a stylish Chrome finish colour changing LED table lamp. The Franklite TL507 Table Lamp is in a Satin Nickel finish with a fully adjustable head and integral dimmer. The Mimax Supra LED desk lamp is a sleek, contemporary table lamp in a Chrome finish. The Kansa Bankers Lamp is a traditional style bankers desk lamp in an Antique finish with a green glass shade. The Oaks Washington Desk Lamp has a Tiffany Glass Shade. Luxury Lighting supply a large range of modern desk lamps and classic bankers lamps. These desk lights are the perfect lighting solution for your home study or office. We have stylish desk lamps and traditional bankers lamps to suit all styles and budgets.